Capcom loves crossing over its various franchises, and the next set of Street Fighter V: Arcade Edition costumes come from one of Capcom’s most popular. Two members of the iconic Street Fighter roster will get new costumes straight out of Mega Man, but that’s not all! Capcom is also digging deeper into its library to bring a costume from Red Earth. Ryu, who is the face of Street Fighter, will be donning the look of Capcom’s other iconic hero: Mega Man! The costume is the perfect fit for Ryu, as his Hadoken will go straight out of the Mega Buster. However, the Blue Bomber won’t be joining Street Fighter alone. Sakura will be able to don the look of Mega Man’s “little sister,” Roll! Both costumes will be available on February 26, 2019, for $3.99 each. Another Capcom franchise, Red Earth, is also getting some Street Fighter love. Alex will be getting a look inspired by Red Earth’s half-lion hero Leo. The costume and “Leo’s Theme” can be acquired in Extra Battle Mode beginning March 15th. There are some original costumes available, as well. 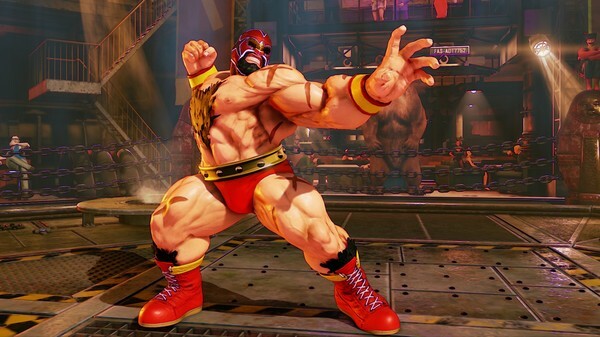 Zangrief will be getting a new costume known as “The Gief,” which turns him into a masked wrestler. The costume can be acquired in Fighting Chance on February 26th. In addition, some fan-favorite looks are back! The “Robot Bundle” gives robot-themed costumes to Zangrief, F.A.N.G., Juri, and Abigail. The costumes can be won separately in Extra Battle Mode, or bought as a bundle for $9.99. They will be available on February 22nd for a limited time. It’s far from the first time Capcom has dabbled in cross-promotion. The latest entry in the fighting series previously got Resident Evil-themed costumes. In addition, Devil May Cry 5 features the Mega Buster as a Devil Breaker for Nero. Will you be getting any of these costumes? Let us know!